Our catering unit is available in Los Angeles County, Orange County, limited parts of Ventura, San Bernardino, Riverside Counties, and limited parts of San Diego County. Minimum fee per area. – $1,000 minimum on the event contract must be reached. – Fundraising events will receive a 15% donation from events whose total sales reach $650 or more! – A minimum of $1,000 on an event contract must be reached. – Mileage fee of $50 will be applied if the location is +55 miles outside Los Angeles, CA. – Fundraising events will receive a 15% donation from events whose total sales reach $750 or more! – Mileage fee of $50 will be applied if the location is +55 miles outside of Los Angeles, CA. – Fundraising events will receive a 15% donation from events whose total sales reach $1,000 or more! We strictly operate on a first come, first serve basis. We suggest to book your event in advanced. – To reserve a date, we must have a signed and completed contract with a $150 deposit (deducted from total amount due). Visa, Mastercard and American Express accepted. – The cost of your event is determined by the amount of product ordered, plus sales tax and miscellaneous charges such as mileage and overtime or the Minimum/Guarantee whichever is higher. – Fundraisers require a fully completed and signed agreement form submitted to our catering department to reserve your date. 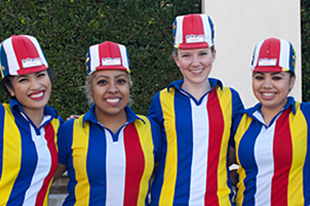 – Hot Dog on a Stick® provides the onsite set up, products, and staff. Product is served in a tray with napkins and condiments. – Tables, chairs, trash cans, etc. are your responsibility. – The booth is a 5×5 set up and requires 10 feet space from behind to accommodate our cookers and generator. – The booth also requires a firm, leveled surface. – Our cookers are powered by a gas generator that can emit noise, but at its lowest level. The request of obtaining power from another source such as electrical outlets will not be accepted. Please be aware that some areas may be inaccessible due to narrow or steep walkways or driveways and low overhanging trees. You are responsible for obtaining onsite locations and any necessary permits. A map of how to get to your location and where you want the booth to be placed is greatly appreciated. Hot Dog on a Stick maintains the right to relocate the set up if the site is not suitable. Join our franchise family as a master franchise owner, and benefit from our industry leading experience in international franchising!